Ahhh. It feels so good to be back to blogging. Between the remodeling of the home we took possession of just before fall, oodles of kids' activities, a computer wiped out by several nasty viruses a few weeks back and the complete malfunction/demise of my (needed-to-be-replaced-anyway) camera, it's been a while since I've brought a new post your way here on JD. But, my sweet hubby recently surprised me with the camera I had been drooling over for the last year. I love it, but will admit that I am so incredibly overwhelmed by it and really don't have the slightest clue as what I'm doing with it. I plan to spend a big chunk of my time in the future weeks watching lots of video tutorials and doing tons of research on this thing. And, I'm gearing up for enormous amounts of practice to get the hang of taking better pics. In the midst of my life's craziness, I've been on a huge salad "kick" recently. This Loaded Slaw Salad with Asian Sesame Ginger Dressing is one that I've been making for my lunch on a regular basis this winter. I know, I know ... winter is supposed to be the season of soups, stews and comfort foods. But, cravings for salads and slaws have been consuming me. So, I thought I'd share this fabulous recipe today with you. I love the crunchy aspect of the red cabbage and carrots here - not to mention the vibrant colors that their inclusion lends to the appeal of this salad. The cilantro brings a brightness and freshness to the slaw. A lovely sweetness is there by way of the thinly-sliced apples. Sugar snap peas are one of my favorite fresh vegetables, so I couldn't not invite them to the party. 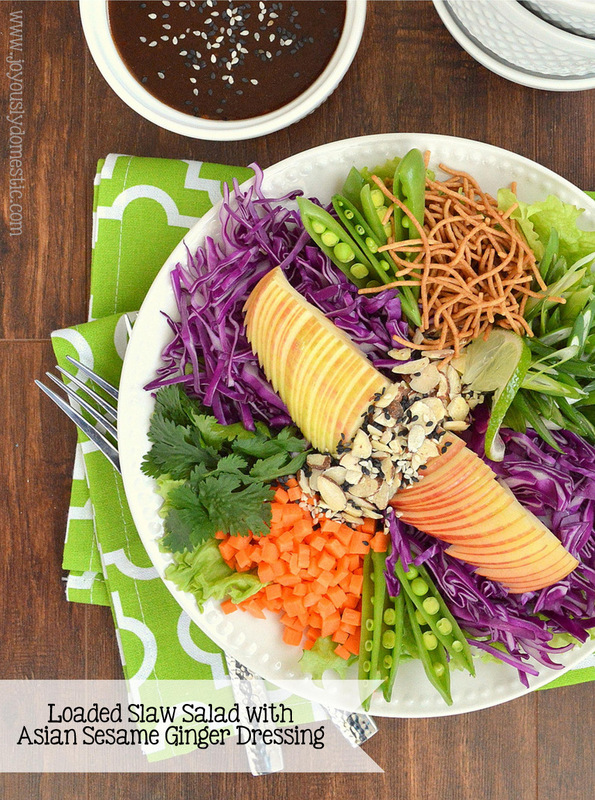 Some sliced almonds and crispy rice noodles add a textural factor that really completes this salad. If you're not up to making the dressing from scratch, there are some good-quality Asian-style bottled dressings on the market. But, this homemade dressing is amazing. It's the perfect compliment to all of those fresh and refreshing veggies. NOTE: Sliced, grilled chicken is the perfect addition to make this salad a more-complete meal. Assemble the salad ingredients in a large bowl or on a serving platter. Ingredients can be arranged separately for presentation purposes until time of service, if desired. Toss ingredients when ready to serve. Serve salad with dressing. Store any extra dressing in the fridge for up to a week. This looks wonderful, the colors are amazing too! Nice to see you back! I was just thinking earlier this week we hadn't heard from you in a while and wondering how the house is coming. Salad looks yummy! Thanks so much for stopping by and checking in. This is such a yummy dressing, so hope you enjoy it! Angela/Angie is an angelic name! :-D I'm going to try this dressing on a chicken wrap(sort of like the McDonald version.). And, using it on the wrap sounds awesome!